So, something sort of hilarious happened yesterday. When I got home from the winery, I sat down to do my menu planning for the week. So, I took inventory of what I had in my freezer, then wrote down what I needed to buy and then surfed the web for some recipe inspiration. 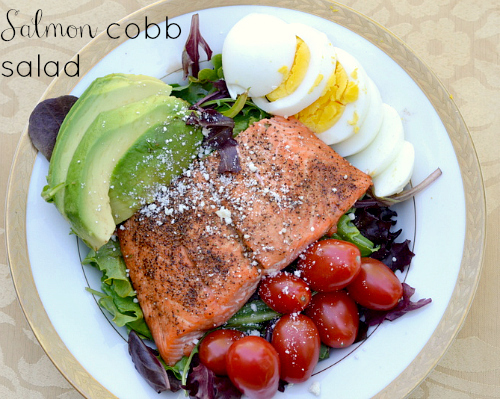 One of the items I was going to make was a salmon cobb salad. Super healthy, full of good-for-you fats, the perfect dinner for my new weight loss efforts. Plus, a new recipe I’ve never made! Well, I googled it and guess what popped up. A recipe I made for She Knows. In April. Yup, I’m officially suffering from dementia. Food bloggers and recipe developers, has this ever happened to you? You just forgot you made something? Well, lucky for you guys, I also realized I never shared this amazing recipe! Which is absurd because it was amazing. In fact, I remade it last night for dinner and it was ever better than I remembered. Sadly, it was also 10pm so I couldn’t retake the photos. But, given it’s resolution month and weight loss is on everyone’s minds, I knew it was too good not to share. I don’t know what part is my favorite. 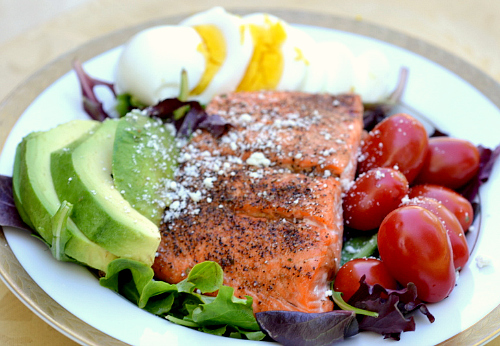 The slightly seared, baked salmon, the hard boiled egg, the juicy avocados or the plump cherry tomatoes. I just can’t pick. Seperate they are amazing ingredients but together? They just SING! 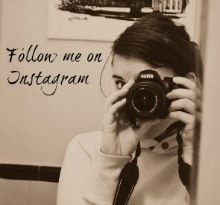 It’s so funny because looking back, I can already see how much my styling and photography has changed. (Thank God I realized you can take photos INSIDE with proper lighting so not everything is blue tinted now.) But, that’s either here nor there. I just HAD to share this recipe with y’all so you could make it. It’s just one of those gems that deserves another shout-out in the food interwebs. Oh and don’t fret when you see the fat, it’s mostly monounsaturated which is a good, healthy fat that fights off LDL (or bad cholesterol!) 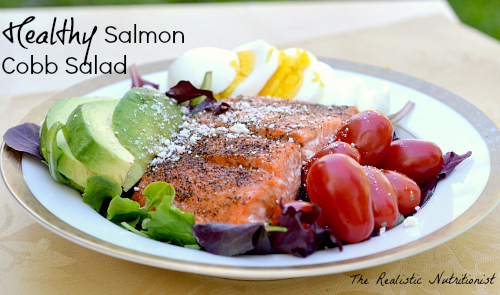 To lower the fat content, leave off the avocado or eat 1/2 the salmon serving. Be sure to check out SHE KNOWS for the amazing, amazing recipe here!! 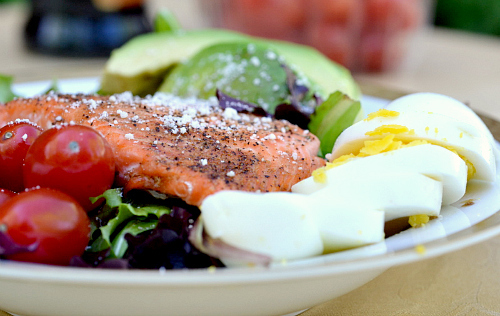 *One salad includes one 4 ounce salmon filet, 2 slices avocado, 5 cherry tomatoes, 1 hard boiled egg & 2 tablespoons dressing. hahahah!! I'm so glad I'm not the only one! Looks fabulous....love the salmon/avocado combo. Heading over for the recipe now! Yay!! It's so easy and so good. Mmmmmmmm I love this salmon spin on the Cobb! I have totally done that!! Apparently I google oatmeal a lot - LOL. This looks insanely delicious. BAHHAHA! I'm so happy I'm not the only one. HAHA! I'm so glad I'm not alone! I'll have a brilliant idea and then realize I pretty much already made the same thing. I, mean, how many times can I decide that Duck Fat Roasted Potato Salad is a new idea? Apparently 3 times. Oh, and I love this salad, totally worth a revisit. hahahah! um duck fat salad sounds so good I'd google it 100 times :)! Ha! This universe definitely has a sense of humor! This looks so good, Claire. I'm a BIG fan of salmon. Pass me a fork, please?!! I know, right? Of course! Look at that salmon! Gorgeous! This happens to me all the time except usually I write down a recipe idea and then remember that I already blogged the same thing, except I posted it with quinoa instead of pasta. Ridiculous! But this salad- not ridiculous at all! I can relate! This has totaly happened to me :) This looks delicious so why not post it twice, right?! me out loads. I am hoping to give a contribution & assist other users like its helped me.